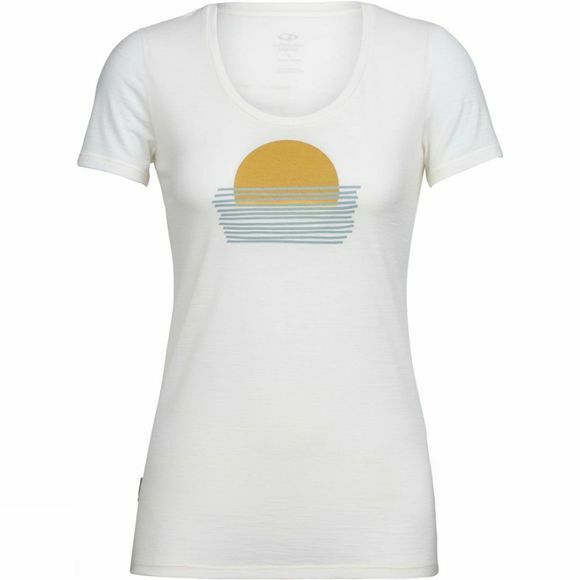 The Womens Tech Lite Short Sleeve Scoop Setting Sun T-Shirt from Icebreaker is a highly breathable, comfortable, do-it-all merino wool T-shirt, the Tech Lite Short Sleeve Scoop Setting Sun is a go-to top for four seasons worth of trails, travels, and active pursuits. With capabilities as varied as the adventures you’ll take it on, the Tech Lite features a flattering scoop-neck silhouette as well as our jersey corespun fabric—nylon fibers wrapped in merino wool to provide added strength and durability while maintaining next-to-skin softness. Original screenprint artwork by Jennifer Cooke adds a unique touch of style.